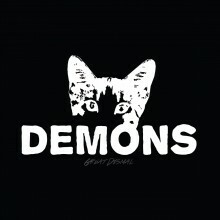 Demons is a new band started by guitarist Zach Gehring, who a lot of you may be familiar with from his work with Mae. But while Mae always went for a much softer rock sound, it’s clear that this project is going off in a different direction based upon “There Is No Reward” (which can be streamed below). The song comes from Demons’ upcoming EP Great Dismal, which will be out on June 16th via Spartan Records, and it starts off with a much heavier groove that sets the tone for what is to come. There’s a certain swagger to the lead riff that when combined with the slightly rougher vocals is attention grabbing. I’m interested in hearing the rest, as it sounds like Gehring and the rest of Demons are going off on a different path that should have plenty of strong hooks to keep listeners coming back. Demons, the Virginia Beach-based musical project started by longtime Mae guitarist Zach Gehring, is streaming a new song titled “There Is No Reward” on Revolver. Spartan Records will release the band’s 6-song debut EP Great Dismal on June 16. Pre-orders are now available digitally and on limited edition 12″ silk-screened vinyl here and here. All pre-orders come with an instant download of the song “Parallel Lines. Decidedly heavier and more aggressive than previous projects, Demons takes stylistic cues from the likes of many influential bands that have shaped Gehring as a musician. Traces of Spiritualized, Pedro The Lion, The Afghan Whigs and Mudhoney can be found throughout the EP; however, that list hardly registers as any type of “recommended if you like” touchstone. The strength of the EP is the sum of its inspired parts, not its function as a sonic homage or tribute. While the untangling of duality — awe and anguish, faith and fraud, hope and horror — is hardly a new artistic exercise, such rich questioning is rarely attempted in the form of an entirely accessible six song EP. Performing the duties of both architect and builder, Zach Gehring (of beloved Virginia-based Mae acclaim) has designed an exorcism vehicle, the aptly-titled moniker Demons, and allowed often-at-odds voices the opportunity to speak. The result is Great Dismal, an oxymoronic battle of declarations, withholdings, distortion, and clarity – – a tussle of the psyche examined through opposing dynamics. Upon first glance, the urgency of Great Dismal can be misunderstood as a sole tone of disparity; however, after repeated listens, other thematic motifs become more pronounced — threads of meaning that, in retrospect, Gehring describes as “tempered hope, humility, and critical self-awareness.” By allowing these conflicting voices to speak, Gehring has begun to exorcise his own demons in an attempt to pave a road toward a more tangible sense of clarity, understanding, and faith — on the other side, those on the same journey will find solace in his courage to press “record” during the process.